Organised by Muscat Road Runners in 2012 with 135 competitors, Muscat Marathon has quickly grown in stature. In 2017, the event became known as the Al Mouj Muscat Marathon with Al Mouj Muscat, Oman’s premier lifestyle destination, Oman Sail and Muscat Road Runners joining forces. Fast-forward to 2019 and the marathon, marathon relay, half marathon and 10K routes were all certified by world-running organisation AIMS, aligning the event with International Association of Athletic Federation (IAAF) standards. The Charity Fun Run 5 KM saw thousands of runners raise money for good causes and the Kids’ Run sold out in record time! The eighth edition hosted just over 8000 runners competing in six race categories across a two-day festival of running. 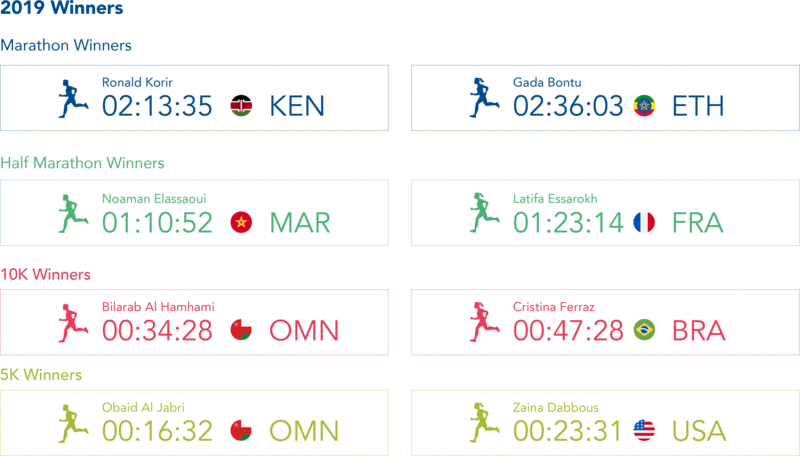 103 different nationalities were represented, furthering the marathon’s reputation as the most iconic event on the Sultanate of Oman’s sporting calendar.